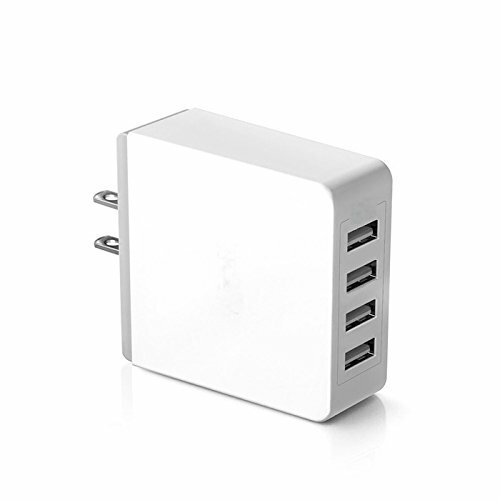 I received the 36W 4 port High speed desktop USB wall charger. It has am amazing 4 USB ports. The speeds on the ports are fast. It takes no time for my phones or tablets to charge. Yesterday I had my phone, my daughters phone and both my tablet and ipad. The phones charged first and the tablets took a little longer but that is normal for them to need more charging time. It has two ports for androids and two ports for iphone's. High quality construction with durable housing and over-charging, over-heating and short circuit protection. Desktop USB Charging station simultaneously power 4 smartphone / tablets / speakers / headphones / and other USB powered devices. Intelligent Technology Detects your device. It is a perfect charger to use at home or to take with you because it is small and compact. I received this USB charger complimentary in exchange for my unbiased review and opinion. All opinions and words are my own.